The luxurious Astoria is one of Cruise and Maritime Voyages finest vessels. It was refurbished in 2013 and has a capacity of 550 passengers. 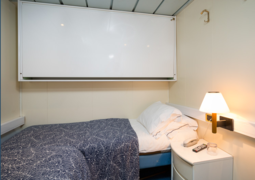 It comes with a wide variety of deluxe cabins, restaurants and more. The Astoria is packed with luxurious cabins that are guaranteed to satisfy all your specific needs. 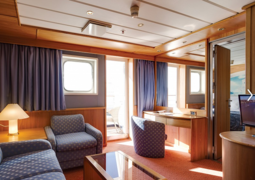 Whether it's an Inside, Outside, Balcony or Suite Stateroom, Cruise and Maritime Voyages ensures that you will have a comfortable and joyous stay. 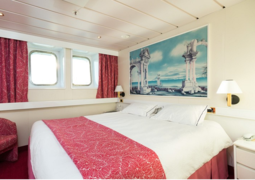 Cruise and Maritime Voyages promises that every cabin will be accompanied with private en suite facilities, premium bedding arrangements and other luxurious amenities. If you reserve one of the Premium Suites, you'll have the added benefit of a Jacuzzi and a personal sitting area. Hunger will never be a problem on board the Astoria with various dining options. In the "Olissipo Restaurant" all the expert chefs and waiting staff will satisfy all your desires. The sumptuous dishes conjured up by the chefs and the premium wines served by the waiters and waitresses will leave no stone unturned in satisfying your taste buds. Alternatively guests can eat "al fresco" in the midst of the daylight sun on the Pool Deck. On board the Astoria there is an endless amount of entertainment outlets. Cruise and Maritime Voyages invite prestigious guest speakers to passionately speak about interesting phenomena in the fields of history, criminology, politics and so forth. In the "Show Lounge" you are guaranteed to be mesmerised by the artists and performers illustrating their specialty acts. It is also possible to listen to music from the revered pianists and violinists who aim to please you in a melodic and transient sense. Card games and table quizzes are also another viable and entertaining option. There are many activities which you can participate in on board the Astoria. Passengers can exercise in a vigorous or relaxed manner at the on board gym. Deck games and quizzes are another popular activity where you can become closer associated with your fellow ship mates. Feel free to go for a relaxing swim in the pool or enjoy a serene full make-over in the beauty salon.